Will the Big 12 Add Another Texas School? One of the major talking points I often see in Big 12 expansion discussions is the notion that a fifth Texas school is a non-starter for the Big 12. While the reasons against adding a Texas school are obvious, there are also a number of reasons that make such an addition favorable. 3) The conference does not want to upgrade the profile of another Texas school. While issues number one and two should be self explanatory, issue number three is more complicated. 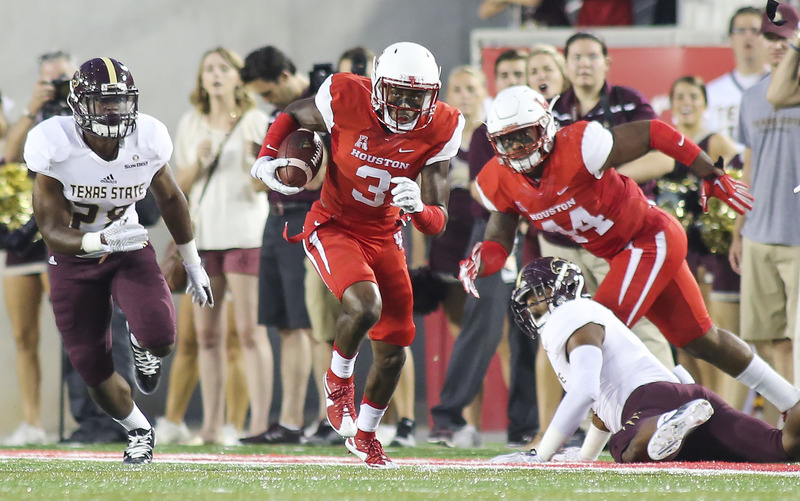 Non-Texas schools in the Big 12 may be hesitant to upgrade the profile of a school like Houston (UH) because of recruiting concerns. A fifth Texas school will attract prospects from the fertile Texas recruiting grounds who are looking to stay closer to home while playing for a Big 12 school. This will make it harder for programs like Iowa State to recruit in Texas because those recruits have an additional option to stay close to home. This will be an even bigger issue for Baylor and TCU who will suddenly see themselves as “equal” to UH rather than the P5/G5 status quo they currently enjoy. But the biggest pill to swallow would be Texas and Texas Tech. These are institutions who compete with UH for state funding and prospective students along with recruits. So for these two schools they have both athletic and academic reasons at play. Large schools are unwilling to help regional competitors succeed because they view that as a threat. For this reason the idea of a fifth Texas school in the Big 12 seems unlikely. But things are not that simple. All of the ideas presented above are a two sided coin and can easily be redirected and be described as a benefit for the Big 12. Here are the counterpoints to them. 1) It would counter Texas A&M and the Big 12 doesn’t need a new market. The Big 12 has four Texas schools, but Texas A&M is in the SEC. Texas A&M and the SEC Network have a considerable presence in East Texas and the addition of a Big 12 school in that region (Houston or Rice) would counter it. This is not about claiming East Texas for the Big 12, but countering SEC schools (specifically western SEC schools with close proximity) who have a newfound presence in the region. The Big 12 has almost no chance of adopting a conference network because that would conflict with the Longhorn Network (LHN), a network that Texas is not going to get rid of unless they leave the Big 12. (2) So the Big 12 doesn’t have to worry about focusing on regions that would be ideal for a conference network. The Big 12 television contract has pro rata increases in the event of a Big 12 expansion. This guarantees that a new Big 12 member will get the same payout as Big 12 institutions currently receive regardless of how large the market of said institution is. So the lack of additional markets being brought in by a new member isn’t an issue for the conference. The only downside from a financial point of view is that this will limit the ability of the Big 12 to negotiate an even larger per school payout. However this issue is becoming less important as current trends suggest the TV executives care more about the market than the makeup of the conference when handing out contracts. In other words the TV executives will look at how much the P5 is making and give the Big 12 a similar deal simply because they are an intact P5 conference. We saw this with the ACC and Big 12 being given such generous deals in the past. This trend exists because the networks think having major football schools like FSU and Texas is worth overpaying the rest of the conference. This also protects their investment because keeping the conference they are paying financially competitive means said conference will be at significantly less risk for future realignment losses. 2) The Texas and non-Texas schools have reasons for supporting a fifth Big 12 school. As things stand now the political arrangement of the conference is very favorable to Texas and the Texas schools. Small conferences like the Big 12 are easy for big schools like Texas to control because they can partner up with one or two schools and block a supermajority on any issue they want. With four Texas schools they hold 40% of the vote and will act as a voting block on any geographic issue such as location of a conference championship game, divisional alignment, and conference offices location. Any expansion without a Texas school will dilute this power. This is probably a key reason for UT being the biggest opponent to Big 12 expansion in the past. What makes this especially difficult for the Big 12 is that UT is the single most powerful school in the conference due to their massive market share. This gives them a ton of leverage and even the ability to overrule the rest of the conference on issues such as the LHN. So not only will the Texas schools be favorable to adding a fifth Texas school in order to advance their own self interests, the non-Texas schools may be forced to comply. Preserving the political influence of UT may be the condition of their support for expansion. In fact the conference will probably expand only if they have the blessing of Texas because it is the one school the rest of the Big 12 can’t afford to alienate. The non-Texas schools are also inclined to support a Texas school but for a completely different reason. The state of Texas overwhelmingly dominates the market and recruiting grounds of the Big 12 footprint. 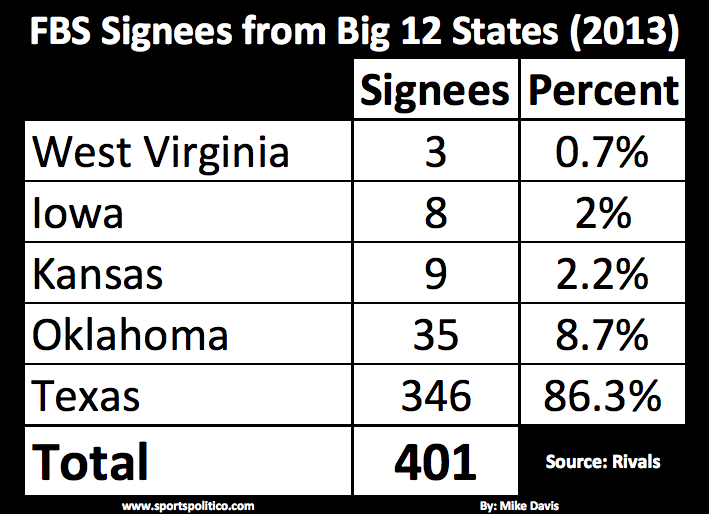 In 2013 of all the FBS signees from Big 12 states, 86.3% came from Texas. 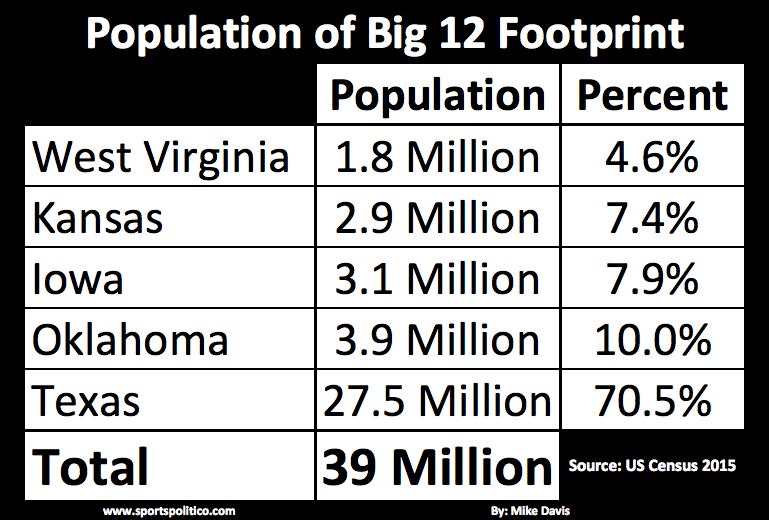 The Big 12 footprint has 70.5% of its total population residing in the state of Texas. Those stats make it clear that having a presence in Texas is critical for schools like Iowa State and Kansas. The current ten team setup of the Big 12 allows non-Texas schools four games a year against a Texas school. In a 12 team setup the Big 12 will be forced to split into divisions which means those four games are no longer guaranteed. That is why adding a fifth Texas school is critical for Big 12 members. It is the only way to maintain or minimize their loss of access to the Texas market when the Big 12 expands. So while a school like Kansas State will have to take an extra slice of the Texas pie, a school like UH will make that pie bigger with the additional access they provide for the rest of the conference thereby minimizing the impact of a more competitive recruiting situation. 3) The Texas schools can be convinced to vote in favor of a fifth Texas school even if they are against it. The direct competition a Texas school will bring in recruiting is a sacrifice the four Texas schools will have to make. The recruiting concerns pale in comparison to their concerns regarding prospective students and state funding. The good news is that two of the four Big 12 schools (TCU and Baylor) are private. This is a critical detail because they (generally) don’t compete for state funding and they tend to have minimal overlap with state schools for prospective students. This is not to say there is no overlap, only that it is not as extreme as the overlap public state schools face with each other. Not only is there less overlap in private verse public, but private verse private as well. So the issue of private or public will be a critical factor in how the Texas schools will perceive Houston, Rice, and SMU. You may ask yourself, do the private schools have the same attitude towards each other as the public schools? The answer is no because private schools see each other as different versions of themselves whereas public schools perceive each other based on where they belong in a system hierarchy. There are only 17 private schools in FBS making them a minority. This adds a mentality of private schools sticking together because there are so few of them. While TCU had plenty of reasons for obtaining a Big 12 invite, the fact that they were a private school likely played a factor in that decision. But this doesn’t mean we should write off the public schools either. The biggest opposition to UH is going to come from Texas and Texas Tech. But those two could easily become the biggest allies for UH if political pressure is applied. This is a road the Big 12 has been down before. Texas Tech and Baylor owe their current position in the Big 12 to state politicians applying political pressure on Texas and Texas A&M to include those two schools when the Big 12 was being formed. Generally speaking state politicians tend to be more protective of their taxpayer supported public institutions than private institutions, but private institutions can also find political protection under the argument of local economics. Texas isn’t the only state or even the most recent example of such political pressure being applied. However if should be noted that the state of Texas has something called the Permanent University Fund which is a (roughly) $15 billion joint endowment fund a number of public Texas schools share (including UT) that can be held hostage by state legislators. This makes it easier for Texas politicians to exert influence on their public schools than most states. Political pressure isn’t something that is guaranteed to happen, but the probability of it happening depends on two things. First whether or not Rice, SMU, and/or UH have allies (such as alumni) who hold key political positions and willing to exert their power to force a preferable outcome. The second is time. The longer the Big 12 allows expansion discussion to be dragged out and be made public the easier it is for outside forces to influence the decision on expansion. In fact the Big 12 not moving quickly and behind closed doors (such as how the ACC added Syracuse/Pitt) is a critical error on the Big 12’s part if they want to prevent outside influence. The Big 12 has proceeded with their expansion process at an incredibly slow pace which will continue to increase the likelihood of political influence. We have already started to see political influence being leveraged after Texas Governor Greg Abbott said: “Big 12 expansion is a non-starter unless it includes University of Houston.” Whether Abbott is ultimately willing to put his words into action is unknown. However his comments are nothing but good news for Houston. There is much to be said about the pros and cons of a fifth Texas school. The talking points I have listed so far are unique in that they are often a double sided coin in that you can take a single issue and turn it into a reason both for and against a fifth Texas school. But I want to focus on a different issue that is only one sided. This issue has to do with the fact that college administrators and boosters are (generally) pretty old. David Boren for example who single handedly started the most recent Big 12 expansion push has been President of Oklahoma for longer than the Sooners have been playing Big 12 football. So why is this important? Because a large number of the Big 12 power brokers (especially those in Oklahoma and Texas) still remember the days of the SWC. Back when the eight largest Texas schools were united in a single conference that existed for 80 years. The Southwest Conference (SWC) may be gone but its ghost remains. One of the themes of realignment is that conferences often target prospective members that they have a prior history with. With every major Texas school having 50 to 100 games played with each other, it is a tremendous advantage to the Texas schools that the other candidates don’t have. This is likely another factor that helped TCU join the Big 12. The “binders” he is referring to are reference material regarding all the advantages TCU and Fort Worth have to offer the Big 12. But at the end of the day, Dodds didn’t care to study the technical details of the institution he was inviting into the conference. All that mattered was networking and probably the fact that TCU was an institution the Texas schools were already familiar with and had dealt with before. Thus the Horned Frogs were never vetted in the way that Louisville for the ACC or Rutgers for the Big Ten were. The culture of the Big 12 in 2011 made it very favorable for a Texas school to join the conference. Even though the Big 12 has changed since 2011, remnants of that culture are still deeply embedded within the conference. Whether all the issues I discussed in this article will open the door for a fifth Texas school is unknown. It was never my intention to pick a side on the debate of the Big 12 going with a Texas school or not. The truth is it all depends on what the current state of mind and the prevailing attitudes of the conference when they vote on membership. That is something that is subject to constant change and really can’t be predicted. If I had to pick I would say being a Texas school is more of an advantage than a disadvantage, but not enough to guarantee inclusion. But one thing for sure is that a Texas school shouldn’t be written off simply because they are within the borders of the Lone Star State. JFK: Why Does Rice Play Texas?